p until a short time ago, I too equated cocktail mixers with Schwepps, Vintage Tonic, and Canada Dry. It's what the grocery store had. I found them all equally syrupy, so I opted for the diet versions (when available). They nearly all exploded on opening, despite being careful not to shake the plastic bottles. It would spray everywhere, and the non-diet versions left a residue as sticky as epoxy. It was disgusting, but I knew of nothing else. Then an article came along about new mixers and artisanal tonics. It may have been in GQ; I forget. But I began reading about a few companies who had begun to take an interest in making real tonic. This means real quinine, balanced with some kind of natural sweetener (not corn syrup), with the perfect amount of carbonation added. The two mentioned were Q Tonic and Fever-Tree. Later on, I found Stirrings in the grocery store. To save you the trouble, I dutifully tried all three with various gins to see what the deal was. Fever-Tree: Thus far, my favorite of the lineup. Crisp, balanced, not overly sweet, and the bitterness of the quinine came through. Carbonation was good with large, tingly bubbles. I've only had the regular tonic to date, but there is a "Naturally Light" version available as well. Fever-Tree is based in the UK, the same nation responsible for the concept of the gin and tonic. A handful of UK servicemen based in India decided to add sugar and gin to their medicine (quinine wards off malaria) at cocktail hour. A perfect idea indeed. 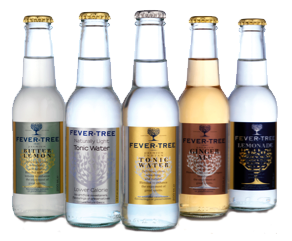 Fever-Tree also produces other cocktail mixers from ginger ale to ginger beer to lemonade. Q Tonic: My least favorite of the three, but still hands down better than any of that mass market nonsense. I couldn't quite figure out what I didn't like about it; I just knew it was quite different. Then I saw the ingredients and realized that they had sweetened it with agave instead of sugar. Q Tonic is an American brand, born in Brooklyn (home of yours truly) by Jordan Silbert. Give it a try - it's most certainly unique; there's in fact nothing else like it! Stirrings: Last but far from least. Stirrings is a close #2 in this competition and could easily rank top depending on what I'm in the mood for. Like Fever-Tree, it is perfectly balanced, has a wonderful flavor, and will make your day. What I found interesting though was that the Stirrings had much smaller, tighter bubbles in the carbonation. To compare it to champagnes, it's like the bubbles in Crystal versus those found in Moet & Chandon. Stirrings is also an American brand with its roots in Nantucket. All of these are better than what you can find in a typical grocery store. Somebody actually took the time to formulate these recipes, and then they bottled them in glass bottles. Glass is the best choice for a lot of reasons; among other things it won't eat away at the plastic container. So the next time you run across these in whatever holy place you found yourself, pick some up and give it a try. I got mine from Amazon after trying them all. They have a fair price and offer free super-saver shipping for it. Only once has a single bottle been delivered in an exploded state; it's been packed pretty well. You'll be amazed at how much better your top-shelf alcohol will taste with these mixers.